Vacation homes shouldn't be a pain—they should be low-maintenance places for respite. Here's how ten lakeside and beachfront retreats use the most low-maintenance of materials: wood. Clad slanted walls and ceilings with wooden beams. 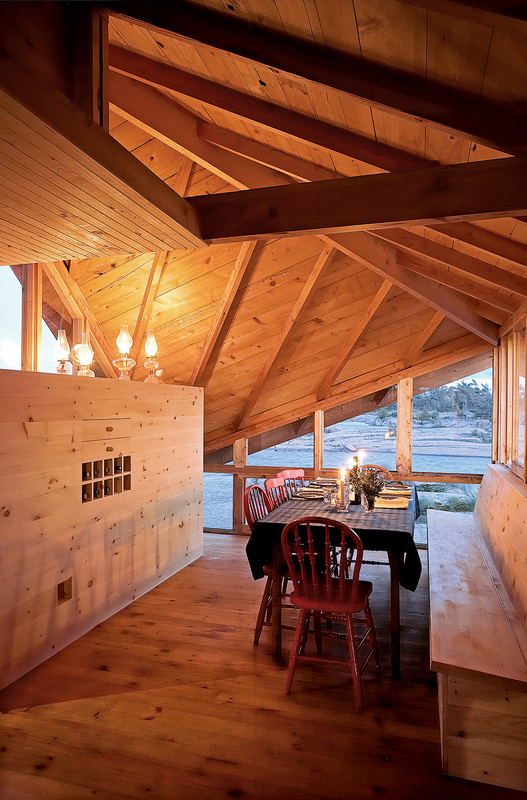 Katja and Adam Thom’s cabin, on an exposed postglacial archipelago in Canada’s windswept Georgian Bay, is more than eight miles from the nearest road. On the edge of a tiny island on Lake Huron, accessible only by boat, this buoyant summer home lives the life aquatic. Los Angeles firm Commune Design remade what was formerly the "dinkiest, cheapest, grossest" trailer at the Paradise Cove Mobile Home Park in Malibu with some ingenuity and bright colors. The custom open shelving was inexpensive to fabricate and holds all the home's kitchen tools with unfussy aplomb. Use plywood for doors and walls. Architect Page Goolrick preserved the humble roots and mellow vibe of this 1960s Long Island beach bungalow with touches like this sliding panel door with matte marine hardware that will age gracefully in the salty air. Incorporate a brise-soleil to simultaneously shield the sun and let it shine in. New York architecture firm Tamarkin Co. used 100-year-old cypress salvaged from the swamps and rivers of Georgia and Florida for the skin and structure of this Shelter Island beach house. A former shipbuilder crafted its 36-foot-long beams. Treat it like a treehouse. On this lakeside plot outside Toronto, four friends forge a new kind of vacation house. The complex is designed to promote an easy flow between the two families' spaces, which include guest cabins and a shared porch for hanging out and eating. Deck out interiors like a boat. On an island 20 miles off the coast of Maine, a green getaway is chock-full of nautical details and space-saving storage solutions like this built-in breakfast nook. On a sandy cul-de-sac in Stinson Beach, California, architects Matthew Peek and Renata Ancona built an elevated modern structure beside a modest 1940s bungalow. Wood cladding on an exterior brings the very concept of a vacation home back down to earth. When paired with glass, like in this lagoon-side abode in Northern California, a facade can be both cozy and open to its natural surroundings. Build a separate house for your pool. Inside this cedar-framed pool house in New Jersey are a 40-foot-long lap pool and a hot tub. Should that feel too limiting or too tame, the Atlantic Ocean is only a short 200-yard stroll away.